Like many fun and interesting Web writings, I 'stumbled upon' a link to Tiffany Beveridge's imaginative and hilarious Pinterest board: Quinoa--my imaginary well-dressed toddler daughter. From there I learned she had a forthcoming book: How to Quinoa--Life Lessons from My Imaginary Well-Dressed Daughter. From a Pinterest board to a book deal?? I had to find out how this happened and get my hands on this book! artwork, the book takes tongue-in-cheek to a whole new level of hip. What I love most about this book is I left it on the kitchen table and, over the weekend, found my 10-year-old daughter and 19-year-old son both reading it aloud to each other, laughing hysterically. Thankfully, Tiffany graciously agreed to talk about her board-to-book journey with us. And be sure to leave a comment to be eligible for a random drawing to win a FREE copy of How to Quinoa; contest closes Friday at midnight 7/18/14. 1. How did a hardworking copywriter and mom of two sensibly-dressed boys give birth to a trend-setting toddler diva? 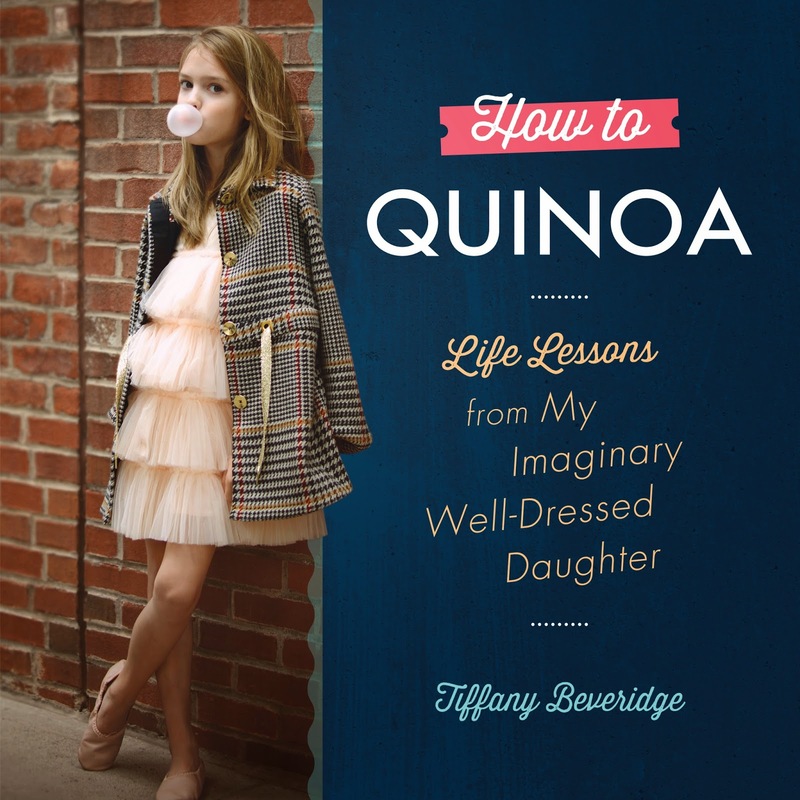 Would you please tell us a little about the journey that led to your debut book, How to Quinoa: Life Lessons from My Imaginary Well-Dressed Daughter (Running Press; July 1, 2014)? I adore my two boys and their endless parade of T-shirts and basketball shorts. The only thing that ever made me pine for another child was the thought of dressing a little girl, which I ultimately decided was not a great reason to get pregnant again. So, I filled that small (and arguably shallow) void by creating a Pinterest board to enjoy dressing a daughter that I wouldn't actually have to breastfeed or potty train. As I began finding and pinning images, I was amazed at how sophisticated children's fashion has become. These over-the-top looks inspired me to create an over-the-top child to match them. In June 2013, my Pinterest board went viral. By September, I had a book deal. By January, I had written the manuscript. By June 2014, I had a book in my hands. It's been an incredible ride, and a dream come true. 2. What inspired you to use Pinterest, a site dominated by photo collages of crafts and food, to tell the fictional story of a preschool hipster? As a copywriter, I've used Pinterest quite a bit as I create content, brainstorm ideas or look for inspiration. Pinterest is an amazing site, rich with ideas, but it's also a Fantasyland. We're able to curate the most fantastical worlds, full of dream vacations, weddings, kitchens and made-from-scratch dinners. If you take a look at someone's Pinterest boards, you'll get a peek inside their imagination. So, in that sense, there's probably a lot of implied fiction on Pinterest already. When I started writing funny captions about Quinoa's life, it felt very natural to put in writing the fictional process that was already happening in my head. 3. Did you ever imagine that your little Quinoa would go “viral” and become a huge social media sensation? Absolutely not. I had always thought of it as a funny inside joke with the handful of friends who followed me on Pinterest. I had been writing the pins for more than a year before it went viral, giving it little thought at all. When it went viral, it was a huge shock. It was like I had been talking to myself in a two-way mirror and suddenly finding out that the entire world was on the other side. It was surprising, but also so flattering to see how much people enjoyed it. 4. Like your pins, How to Quinoa both spotlights and mocks cultural and social trends. Did you dream up Quinoa with a serious mission, or was your original intention just for fun? I like to think of Quinoa as a social lens. We can look at things through her eyes and maybe see them in a new light. I obviously have opinions on a wide variety of things, but I have no agenda other than to make people laugh. I've found that different people focus in on different themes, some that I haven't even intended, and I think that's great. Take what you want from it and have a laugh while you're at it. 5. How much of a role did your real-life family play in the creation of your imaginary well-dressed daughter? detention for being obscenely precious. Well, I think it's safe to say that if I had two daughters instead of two sons, Quinoa would not exist. So, in that way, my real life family definitely played a role in this. We live a very fun and active life, but we don't do a lot of girly stuff. (Although, sometimes my boys will watch The Real Housewives with me.) I think the entire idea grew out of that, but maybe I'm wrong. Maybe if I had two daughters, I would have started a Pinterest board about my imaginary dirt-covered toddler son Harold. 6. Do your sons have a sibling rivalry with Quinoa? No, they are delightfully detached from her. Although a few months ago, I was standing outside our house with my eleven-year-old, Max, lamenting that the house needed to be painted. He asked me if insurance pays for that. I laughed and said no, that hopefully Quinoa would pay for it. He put his hand on my shoulder, looked me in the eye and said, "Mom, Quinoa can't pay for everything." 7. Where do you find the stylish, stunning, and sometimes startling images of the children who represent Quinoa and her friends? Every image I have used on the Pinterest board was an image I found on Pinterest. There is a never-ending supply! 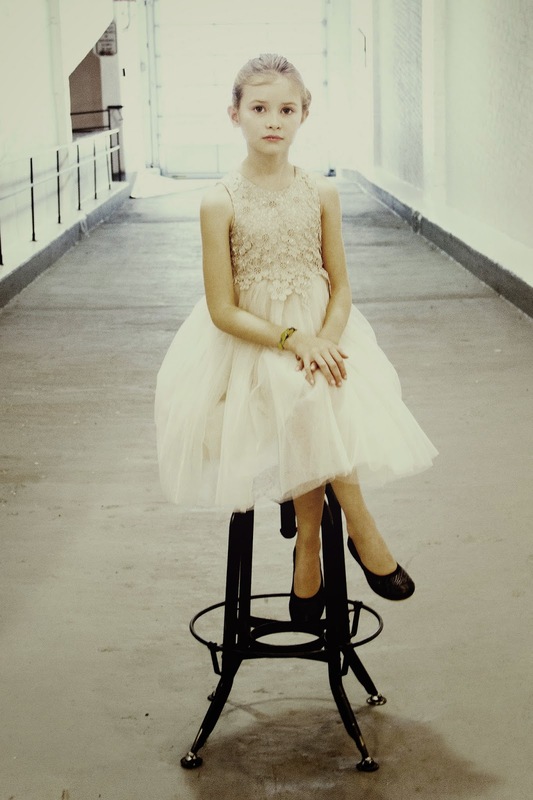 There are some incredible photographers and magazines that are taking children's fashion to a new level. It's quite an art form. 8. Do you know actual parents who dress their kids like Quinoa, Chevron, Boursin, Chobani, Hollandaise, and the gang? I really don't. I live in an area where the kids seem to dress primarily for comfort. It's been funny to read different things about Quinoa and her friends. People will swear I'm spoofing Brooklyn. Other people will swear I'm spoofing Austin, Beverly Hills, Portland, or even London. So while I don't know these kids, I'm convinced that they do exist. 9. While we’re (sort of) on the subject of naming names, how do you choose the names for your fictional characters? Do you have a favorite? I love to find words that are beautiful and interesting as a word, detached from their definition. Quinoa is a fun word to say, as is Chevron, Boursin and Chobani. But I also like words that have some cultural reference, either gourmet foods, pop culture or even pharmaceutical. For example, I've had fun using names of medications like Paxil and Allegra and Humira. 10. Based on your extensive observations of children, do you think kids have a natural sense of swag? Or do you think parents and other adults have imposed this idea on them? I think clothes are one of the very first tools of self expression we give to kids. Showing a preference for a certain color or style is a way that a kid can express who they are, before they have a vocabulary for it, and I think that's incredible. I love that children's clothes are becoming more diverse, less gender stereotypical. Obviously, when kids are tiny and not self aware, their "style" is a reflection of their parents, but I think for certain kids, they enjoy taking the reigns at a surprisingly early age. I have twin nieces and my sister-in-law would dress them the same each morning and by the end of the day, they had modified this or that and looked completely different. 11. Of all the fashion and cultural trends you’ve spoofed through Quinoa, do any stand out as exceptionally ridiculous? There have been a couple images I've used where the girls look especially made up, with a lot of makeup and hairstyles that look more adult. Of course, if I saw kids who looked like that in real life, it would be disturbing, but I understand that this is an art form and a business and there's an editorial aspect to it. 12. What would you like readers to learn and take away from How to Quinoa? Or would you like your readers to just enjoy the humor? Like the Pinterest board, I hope the book will allow people to find different themes that stand out to them. It was so much fun to write some Quinoa-inspired prose instead of one or two sentences for a caption, so I hope that people enjoy exploring Quinoa's world in a more in-depth way as much as I enjoyed creating it. And yes, I hope they enjoy the humor. I hope there are LOL moments on every page. 13. Now that she’s conquered the Web and gotten to star in her own book, what’s next for Quinoa? Quinoa is quite driven, so she has a lot of great ideas up her sleeve. We're pursuing some fun options right now with TV and even a possible gaming app. She barely has time to take a nap anymore! 14. What’s next on your creative horizon? Writing is my passion, so I'm excited to have published a book and look forward to many more projects. I'm working on a memoir right now, which is challenging and fun. Challenging and fun is my favorite kind of work. Follow Tiffany's board on Pinterest here. Follow her on Facebook here. Follow the antics of Quinoa on Twitter here. And, by all means, go out and buy her book! I'd let you borrow my copy, but I'm rereading it ... again! And be sure to leave a comment to be eligible for a random drawing to win a FREE copy of How to Quinoa; contest closes Friday at midnight 7/18/14. You're welcome, Tiffany. We appreciate your allowing us to share Quinoa and your awesome book on our blog! Thank you for featuring my little Quinoa! Sounds like this book would be a fun read and make an interesting gift - an engaging blend of witty writing, visual content, and a viewpoint on self-expression through forward fashion. At a young age, my daughter had a unique and keen sense of self. One of the ways she expressed herself was through fashion. As an actor, she was used to being in costume, and in part, she extended this into her daily life. I was proud of her confidence and desire for self-expression that was never intended to be a conscious, "Look at me, I want attention!" sort of thing. It was about feeling comfortable in her own clothes instead of pretending to be part of the GAP, Juicy Couture, or American Eagle crowd. I stumbled upon Tiffany's MIWDTD board over a year ago, and have been following ever since. I enjoy most her humorous explanations for the fashion shoots that sometime border on the bizarre, as well as the "Pin-centric" names! It all makes sense, from a Quinoa perspective! One thing I have been wondering about is the copyright aspect of the pictures in her book - did she have to get permission, or take photos just for the book? She got permission from the photographers to include their images in the book. In her acknowledgments, Tiffany thanks them as well as the models and their parents for their support of the project. Aren't the photos amazing? I love Tiffany's board! This book sounds like it will be too cute to share with my friends in fashion. Thanks for the interview! Thanks for stopping by, Halle. The book is so much more than the Pinterest board--which is already amazing. If you don't win our copy, be sure to buy one. So much fun! Big Quinoa fan here. Great interview, even better book. It is a great book, isn't it, Jesse? I'm sure you wouldn't mind winning another copy to share with a friend. Thanks for commenting! Love following the posts! Can't wait to get the book! Thanks, Amy. I know you'll appreciate Tiffany's sense of humor. Congratulations, Tiffany. I love how you got a book deal from something you started for fun...that ended up putting smiles on many faces! Isn't it fun to see someone's passion rewarded in such spectacular fashion, Cindy? Considered yourself entered into our drawing to win a copy. Using Random.org, we generated the number three. Since Annette was the third person to comment, the free copy of How to Quinoa goes to her! Email me (pamela_hammonds@yahoo.com) your address, Annette, and I'll get a book sent to you. Thanks!